Jade-Glass-2010-welcome to china marmoglass, nanoglass, nano crystallized glass panel crystallized glass panel,crystallized white stone,white marble,minicrystal stone. CHINA MARMOGLASS CO.,LTD announce a new and unique surfacing material called jade glass 2010 series (JG2010). This material is consists of crystallized and fragmented glass element and can be a variety of colors. 1. This is an entirely self-developed product, jade-like and high-class looking. It is the first of such product made in China and also of superior quality on the world market. 2. It is a high-grade, environmentally friendly building material, containing no harmful radio-active elements often found in marble and granite. 3. Jade has always been regarded highly throughout the history if China. Jade glass has the look of jade while cause no harm to human health. 4. The wide range of products of jade glass is rich in colors and also has fine texture. The products can be classified into two basic categories, I. E. Opaque and semi-transparent. 5. The products are made from inorganic materials, instead of from organic resin chemical materials. Thus jade glass has the character of non-aging and non-color fading. 6. It can be used both in-door and out-door, resistant to weather elements. 7. It is easy to clean, non-water absorbing and resistant to various pollutants. Unlike stone materials. Jade glass is extremely steady in terms of its color and texture. 8. 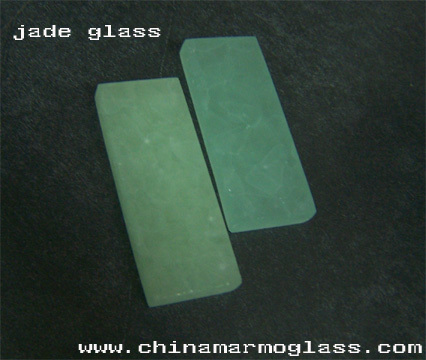 Jade glass(2.6-2.7g/sq. M)has good properties in terms of pressure bearing and resistance to bending forces. Superior to ordinary glass(2.5g/sq. M) and stone materials. 9. Unlike ordingary glass, broken jade glass contains no sharp pieces thus is not harmful to people. 10. Jade glass is superior to natural and man-made stone materials in terms of resistance to acid and alkali erosion. 11. Our jade glass is easy to process. Glass and stone slab workshop can use large sheets of jade glass to cut, drill, standblast, carve and acid etch accordingly. It can alsobe processed on construcion site. 12. Our jade glass is easy to process. Glass and stone slab workshop can use large sheets of jade glass to cut, drill, standblast, carve and acid etch accordingly. It can also be processed on construciton site. 13. Sheets of jade glass can be bent into curve shapes, thus can be used as screens of to cover round columns and building corners. 14. Jade glass 2010 building and decoration materials are easy to install. All methods used for installation of stone slabs and ordinay sheets of glass are suitable for jade glass. For more photos and detailed information, please feel free to contact us.